For one-semester courses in A&P Lab. 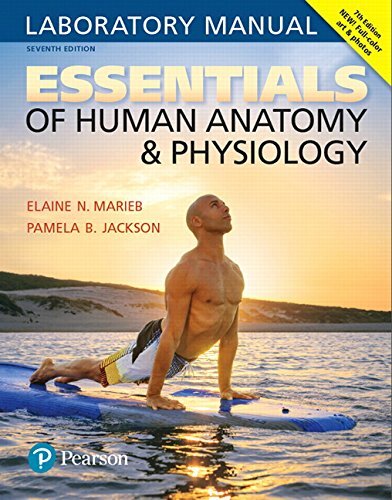 Developed especially for a fast-paced, one-semester A&P course, Elaine Marieb and Pamela Jackson’s Essentials of Human Anatomy and Physiology Laboratory Manual, 7th Edition provides 27 full-color, hands-on laboratory exercises, along with a built-in Histology Atlas. The Lab Manual can accompany any one-semester A&P text, but it is most effectively paired with Marieb and Keller’s Essentials of Human Anatomy & Physiology, 12th Edition. Each lab exercise consists of a variety of easy-to-follow activities, all supported by a checklist of materials, a Pre-Lab Quiz, background information, learning objectives, and tear-out review sheets. The black and white figures in previous editions are now in full-color, and the 7th Edition further expands on its student-friendly writing style with updated terminology and review questions, streamlined content presented in tables, and a new, more intuitive design.